Kemba achieves another 5 star rating (Superior) from Bauer Financial on latest Qtr. Financials. My Mobile Money for all Debit Card Users! Download the “FREE” My Mobile Money Access app today to manage account alerts and monitoring anytime, anywhere from the Apple App Store or the Google Play Store. My Mobile Money Access app. The My Mobile Money app allows you to manage, control and monitor the types of transactions your debit card can conduct and how it can be used by adjusting various settings. You can turn your card off when not in use for greater security of your personal information. Click here after viewing video to learn more. Call 901-795-9055 for more details. 3800 branches coast to coast for your convenience to conduct your business? where you work, live or travel! Moved recently or planning on moving? 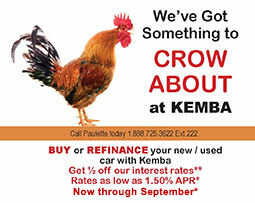 Join Kemba Delta FCU Today! ©Copyright 2018 KEMBA Delta Federal Credit Union. All rights reserved.